We’ve created many graphs through this challenge in recent months: bars, lines, scatterplots, dot plots, slopegraphs, and waterfalls. We’ve tackled some makeovers (more graphs!). When I asked folks what we should do next, even more graph varieties were volunteered. This is great, and I’ve added some ideas to the list for us to tackle in the future. But this time we’re going to do something a little different. 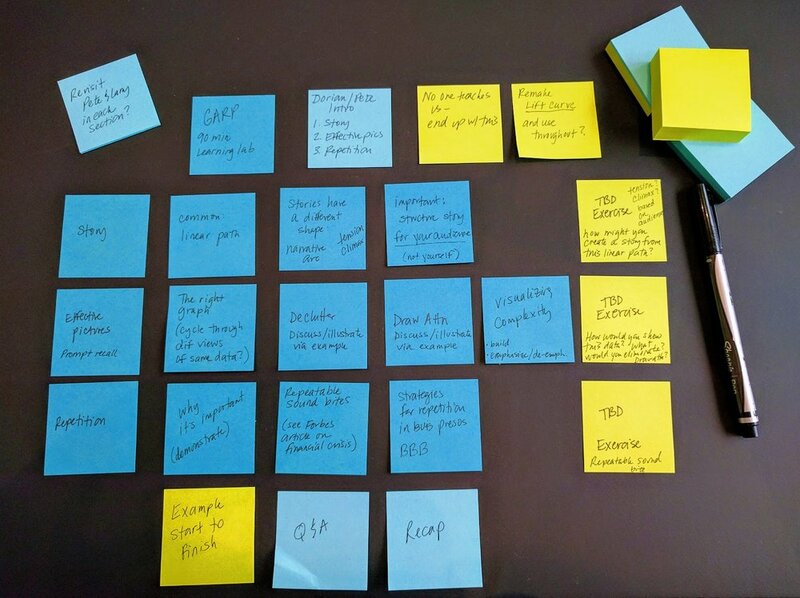 For me, sticky notes are an important instrument in the planning process for communicating effectively with data. I find that they typically work best once you have a good understanding of your data (you’ve analyzed it) and are at the point of needing to communicate something about it to someone else (often in a business setting, this ends up being a slide deck). Sticky notes are my preferred tool for planning the actual communication. 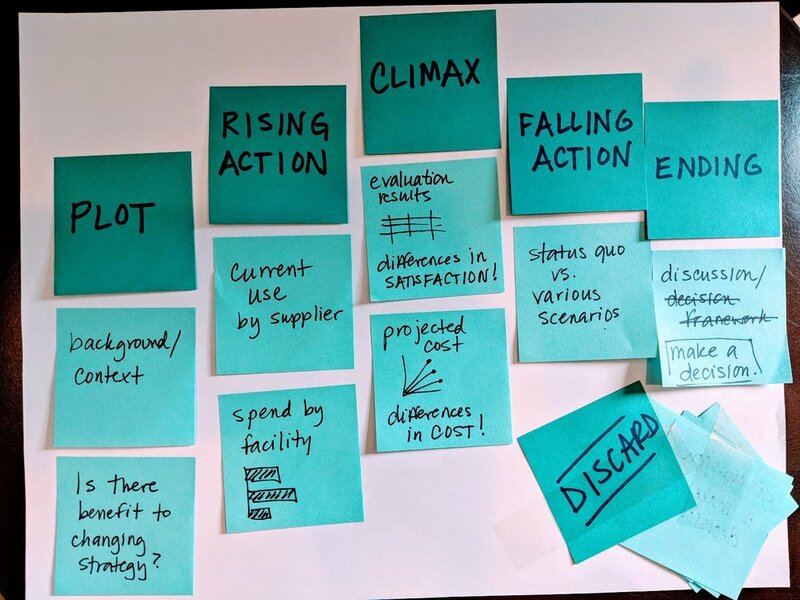 I use them to storyboard, generating a visual outline of the content I plan to create, or—for scenarios that call for it—to identify and arrange components along the narrative arc. The idea is that each sticky note could eventually become a slide in my deck, a section in my report, or possibly a graph on my dashboard. You’ll see some examples of my sticky notes in action at the bottom of this post. I like sticky notes for a number of reasons. They are small, which forces me to be concise with my ideas. They lend themselves to being easily rearranged so I can explore different narrative flows (note that the linear chronological path is usually what comes most naturally, but is not always the best route for our audience!). Also it doesn’t take much time to write a thought down on a sticky note, which means I form less attachment to the ideas compared to if I were to fully mock something up or create it in my tool. When I’m intentional about it, my sticky note storyboarding is done in two distinct steps: brainstorming and editing. I start with the cathartic process of brainstorming—getting myself a stack of sticky notes and writing down potential pieces of content, without any concern for whether they make it into the final communication or how to order them. It’s simply a process of getting all of the ideas out of my head and out into the world on paper. After I’ve spent some time doing this, I take a step back and the editing process begins. I start to group related topics, consider what overall structure will help me pull them together in a way that will hopefully make sense to someone else, and I discard some ideas. This is a critically important part of the process. I think when we go straight to our tools, there is this idea that the communication we create needs to answer any possible question that might come up. Whereas when we start low tech and can physically look at each potential piece of content and ask ourselves: does this help us get our main point across? we can intentionally decide not to include some things. Which leads me to probably the biggest benefit of using sticky notes up front to plan—doing so often leads to shorter communications. Which means you then have the time to make the content of those shorter communications really effective. My challenge to you: use some sticky notes. I’d love to see people do this with real work projects (feel free to redact or be generic in your terms to preserve confidentiality as needed). You’re of course welcome to use a personal project or area of interest as well. Unsure what to do? Revisit one of your (or someone else’s) prior #SWDchallenge submission and consider how you could incorporate it into a broader communication. I invite you to use sticky notes in whatever way will be useful for you. Maybe you’ll use them like I do to storyboard or align your ideas along the narrative arc. 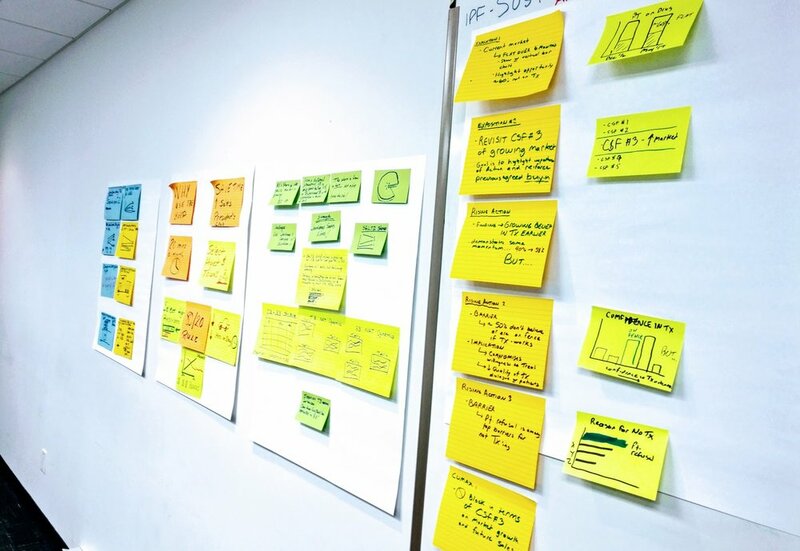 Perhaps you’ll use giant sticky notes to mock up slides in a presentation. Maybe you’ll plan and organize sections of a report or graphs in a dashboard. I’ll bet some of you will use sticky notes in ways that I haven’t even imagined. I can’t wait to see it all! DEADLINE: Thursday, 11/8 by midnight PST. Make it. Identify your data (if needed—this month’s challenge is a little different) and create your visual with the tool of your choice (use whatever color and size stickies you want! ha!). If you need help finding data, check out this list of publicly available data sources. You're also welcome to use a real work example if you'd like, just please don't share anything confidential. Share it. Email your entry to SWDchallenge@storytellingwithdata.com by the deadline. Attach your image as a .PNG. Put any commentary you’d like included in our follow up post in the body of the email (e.g. what tool you used, any notes on your methods or thought process you’d like to share); if there’s a social media profile or blog/site you’d like mentioned, please embed the links directly in your commentary (e.g. Blog | Twitter). If you’re going to write more than a paragraph or so, I encourage you to post it externally and provide a link or summary for inclusion. Feel free to also share on social media at any point using #SWDchallenge. I look forward to seeing your stickies! Stay tuned for the recap post in the second half of November. Related resource: Simon Beaumont and team at JLL have been running their own monthly challenge at work inspired by #SWDchallenge and have been kind enough to write up their process to share. Each month, they pick a challenge to participate in, create their visuals, then get together via webex to present their work. They are applying learnings from this to their own projects and using it to spread best practices throughout their organization. Well done, folks! *They need not even be sticky—in a pinch, cut up paper for nearly the same experience (add some tape once you’re set on the order and need the stick). Also, I’m consciously moving away from referencing “Post-it” notes so I don’t sound like a 3M advertisement; your stickies need not be brand name! Check out the #SWDchallenge page for all of the historical monthly challenges and recaps.